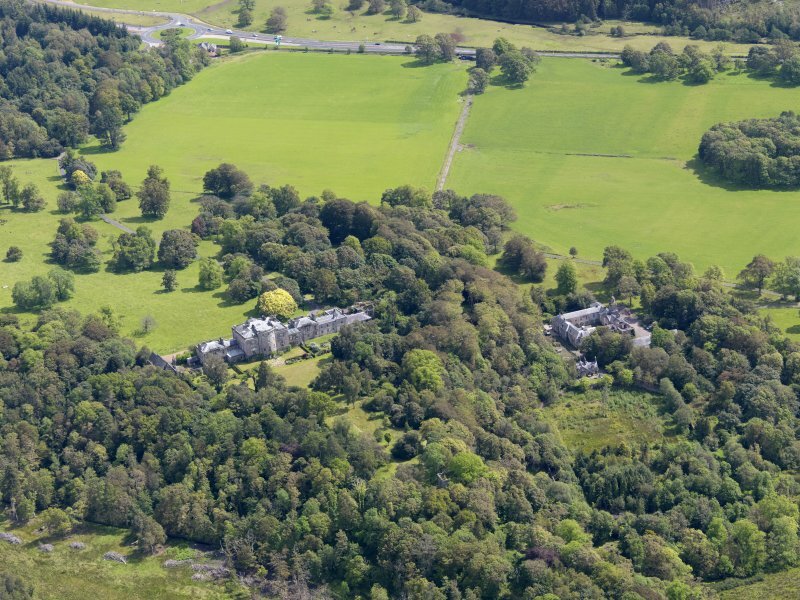 General oblique aerial view of Ardgowan House and policies, taken from the W.
General oblique aerial view of Ardgowan House and policies, taken from the WSW. Inverkip Tower. General view from NW. 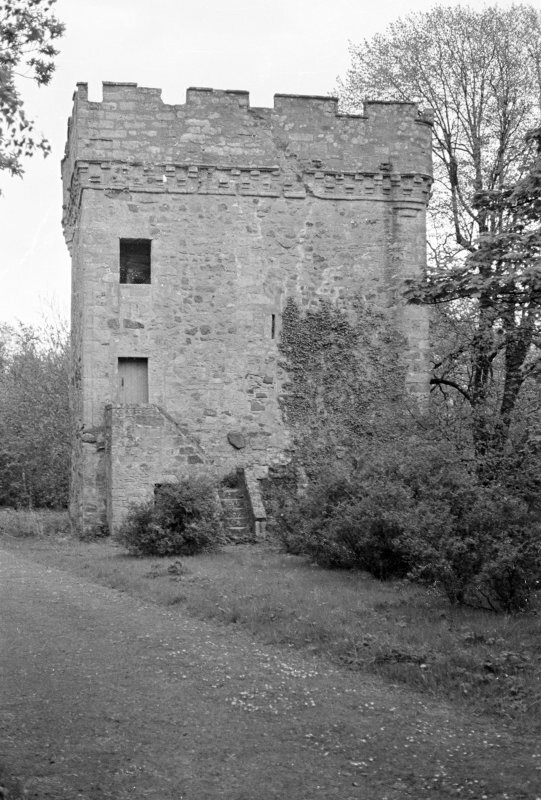 Inverkip Tower. View from SW. 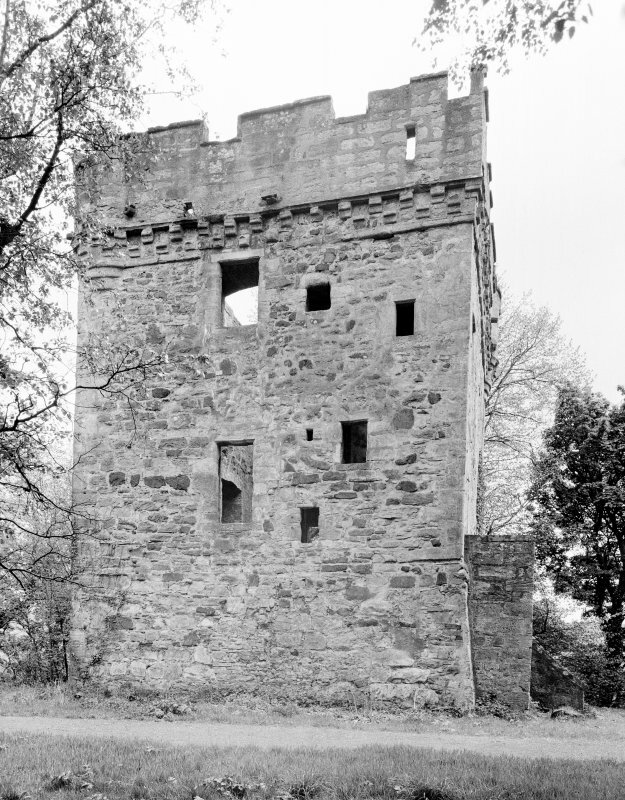 This tower was originally published as "Ardgowan Castle", the name it is given in the SDD list, however, it is called "Inverkip Castle" by Tranter and Barrow. It now appears as a small but substantial square tower of the late 15th century, now roofless but with the walls intact. It has been three storeys and a garret in height. The main doorway at first floor level, is reached by a comparatively modern stone forestair; the vaulted basement is guarded by a keyhole-type slit. Inverkip was besiged in 1306 by Robert Royd of Cunningham, a supporter of Robert Bruce. It was in the Stewarts lord-ship, but whether it was held in demesne or not is uncertain (G W S Barrow 1965). 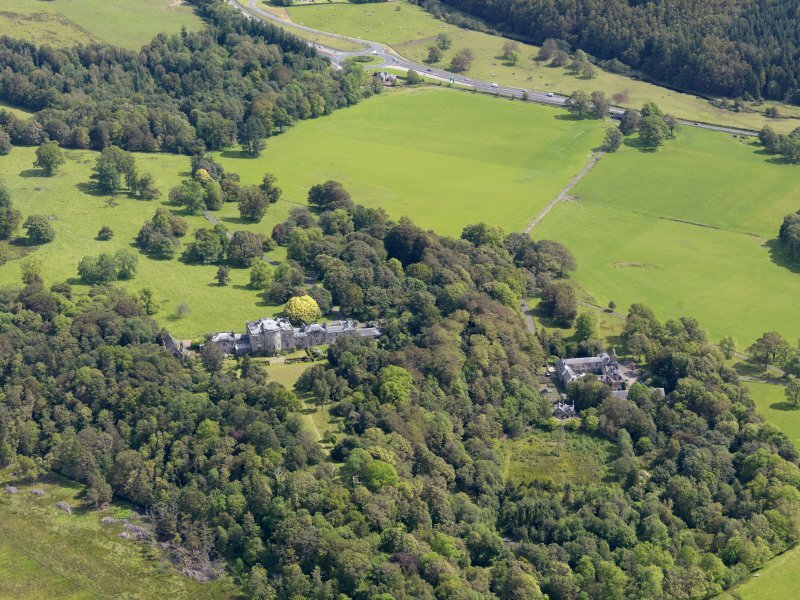 The present fortalice is much later (than 14th century), though it may incorporate previous building (N Tranter 1965). A rectangular tower, in good condition, situated on the edge of a cliff; it was apparently completely repaired and restored in 1936, several stones with that date having been inserted in the walls. The lower storey has a cellar or storeroom with a vaulted ceiling; the entrance to it is in the N corner of the W wall. The tower is of coursed masonry, measuring 9m by 7m and approximately 12m high; the walls are 1.5m thick and are topped with a small battlement. The windows are broad, rectangular and widened on the inside. Visited by OS (JD), 21 July 1955.